One thing is certain, sustainability has a balanced return that is environmentally, socially and economically centric. 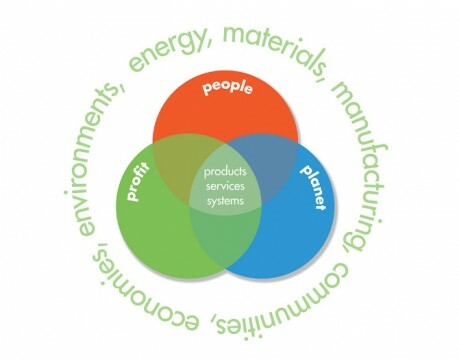 In other words, sustainability has a triple bottom line. The majority believe the triple bottom line focuses on planet, people and profit. Thru the lens of a union worker this means protect, produce, and prosper, at least according to BlueGreen Alliance. Do you see the difference? The BlueGreen Alliance Conference in Washington, DC kicked off last night with an impressive panel of speakers: David Foster of BlueGreen Alliance, Mike Brune of the Sierra Club, Rick Terven with the United Association, Marc Norberg with Sheet Metal Workers Union of America, Jim Harrision representing Utility Workers Union of America and Leo Gerard of the United Steel Workers. With America's infrastructure in mind, Leo rattled off a slue of statistics: 10-15% of the energy transmitted on the grid drips off the power lines; antiquated heating and cooling systems litter our dated schools; over 86 thousand bridges are deficient and need repair; and there are over 4 thousand inadequate dams and are presently jacking up the cost of insurance for our towns and plants. Check out this short video: Good Jobs, Green Jobs Conference 2014 Kick Off. All this equates to opportunities for jobs and working with materials Made in America to improve and enhance our built environment. When focusing on a holistic approach to improving and enhancing our infrastructure, is there really a need for unions? Living outside of Washington, DC, with many friends and family in the construction industry, I often hear unionized labor is unnecessarily expensive with union dues and now possibly, "agency fees." See The Supreme Court Case That Could Clobber Public-Sector Unions. Working with unions adds weight to the triple bottom line. Is it balanced? When local and federal government have a commitment to fair trade and fair employment, as well as a cleaner and safe environment in balance with present and/or future prosperity, it would seem working with unionized workers is irrelevant. I continue to hunt for the entire answer. There are many stakeholders involved, and to understand this completely requires extensive research. With layered union costs, it’s logical to pose the question and say out loud: do unions help the triple bottom line? Please submit comments to info@leafkey.com.